Fourth graders have begun an in-depth investigation of engineering, learning basic principles of structural engineering including shapes, forces, materials, and loads. Over the course of the project they will welcome various guest experts, conduct experiments, and use the new St. Petersburg Pier as their case study. 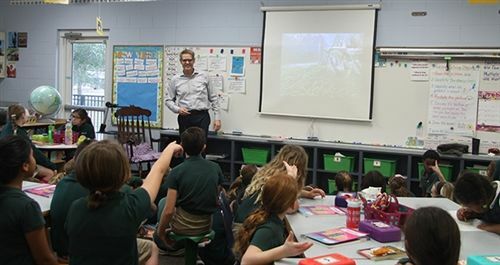 First, in Ms. Auletta's art class, fourth graders heard from Stephen Johnson, an architect from Harvard-Jolly who is working on the design for the new building at Shorecrest. Ms. Auletta shared, "He gave the fourth grade students an overview of the history of architecture and some background on this life as an architect. Then he brought the students through the design process and got them very excited to begin designs of their own." Next, the students will sketch their own visions for the campus playground space using information they've gathered from one another in peer interviews. Back in the fourth grade classrooms they discussed building foundations and the effects of settlement, then constructed a model to demonstrate how force can impact a foundation. From broad principles to seeing them in action, the students transitioned to studying specifically about the new St. Petersburg Pier project. David Fusco, an engineer from Thornton Thomasetti, along with John Curran, an architect from ASD | SKY, visited the students to discuss the unique design and engineering challenges of a the Pier project. "It's a building and a bridge," the students were quick to remark. Mr. Fusco and Mr. Curran shared the renderings and current progress of the Pier project, noting the benefits of different shapes for trusses, explaining static loads vs. dynamic loads, and how math, science, and art combine for successful engineering and architecture projects. The students then had the opportunity to try at hand at engineering themselves. In groups of five, the students used 10 gumdrops and 20 toothpicks to build a structure that could support the weight of a book. All of the groups were able to build a structure that could support one book, but two groups' structures held 5+ books! Following the design challenge the students had the opportunity to ask questions, of which there were many: What happens to the Pier project if there's a hurricane? Was it one person's idea or a team's? How much weight can the walkway hold? How do you plant grass on a concrete pier? When did it start? When will it finish? To further the engineering work, fourth grade met with Stephen Knauss from Terracon. He is a geotechnical engineer who analyzes the ground beneath the pier to determine where and what kind of pilings are needed to support the load. The students were amazed to learn that engineers do this by drilling 250 feet under the ground (that is underwater) and studying the soil and rock samples. The students will learn more about the Pier when they visit the construction site downtown on March 2. In the meantime, they will continue their investigations in class and host more guest experts to share their knowledge.